Dunkin' Donuts is launching a Glazed Donut Breakfast Sandwich. The breakfast item contains a pepper fried egg and bacon slices between halves of a glazed donut. Dunkin' Donuts tested the breakfast sandwich in April and it apparently did well enough that the company decided to make the item part of its regular menu staring June 7, which is also National Donut Day. Grub Street tried one of these sandwiches in April and described the egg in the sandwich as a tasteless "yellow-and-white cylinder with the consistency of a rubber pillow." 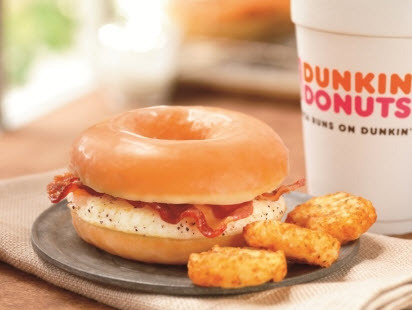 Dunkin' Donuts has an article about the creation of its Glazed Donut Breakfast Sandwich. This is how Dunkin' Donuts Chef Stan Frankenthaler describes the taste profile: "The glazed donut is light and fluffy and gives you just the right amount of sweetness. Combined with the lightly salted, smoked bacon, the texture and flavors marry together in a wonderful way. It's a delicious bite of the perfect harmonization of sweet and savory flavors." Nutritional information about the sandwich can be found here. It has 360 calories.